HouseHunt, which measures crime statistics and data and then compiles it into a list, has named the Town of Cicero as one of the safest cities in America. In the list of cities with populations of 75,000 or more, Cicero was named as one of the nation’s Top 20 Safest Cities ranking number 19. There are 12 cities in Illinois with populations over 75,000. Cicero is the only one from Illinois on the list. There are some 600 cities in the country with populations over 75,000. Cicero is very proud again to be included in the list. We were included in the 2011 list, also. 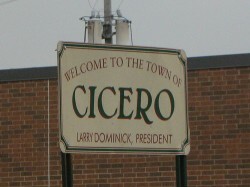 “Safety is what Cicero residents want,” said Town President Larry Dominick. In 2004 before Larry Dominick was elected President, there were more than 17 street gang related murders using a gun. In 2010, there was only one. In 2011 there were none, and in 2012 there were two. Street gang violence is preventable through a strong Gang Crimes Unit and their hard work, and by providing programs to the Town’s Youth and families to compete with street gangs.